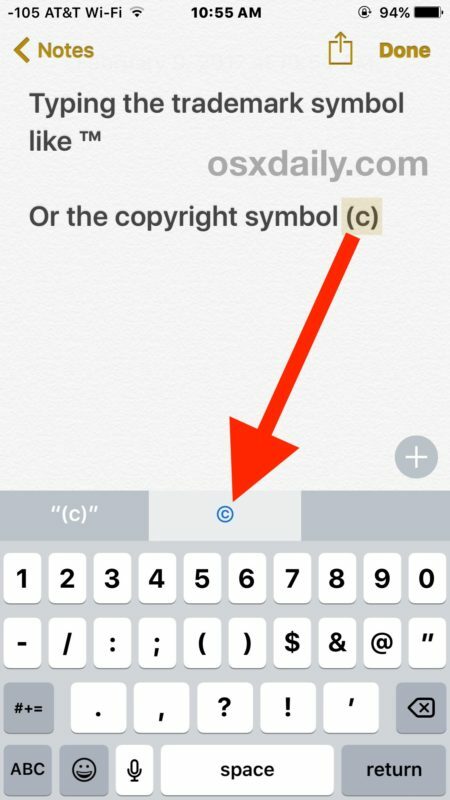 If you find yourself needing to type a trademark symbol, copyright symbol, or registered symbol on the iPhone or iPad, you can do so easily using either of the two methods below. 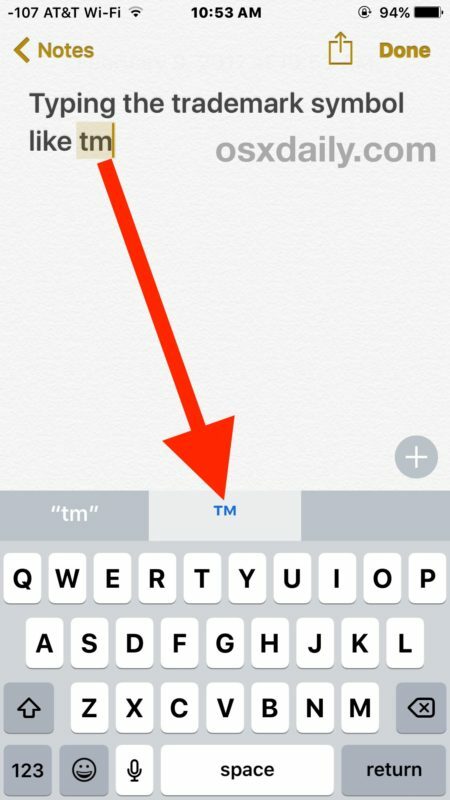 The first trick to typing the trademark symbol “™”, the registered symbol, “®”, or the copyright symbol “©” will utilize the QuickType suggestion bar on the iOS keyboard, and the second trick uses the Emoji keyboard to type the same special character symbols. The QuickType method may be easiest for some users, but if you don’t use QuickType bar or you have a version of iOS that does not support it, you can also use the emoji keyboard on iOS to type the same special character symbols. 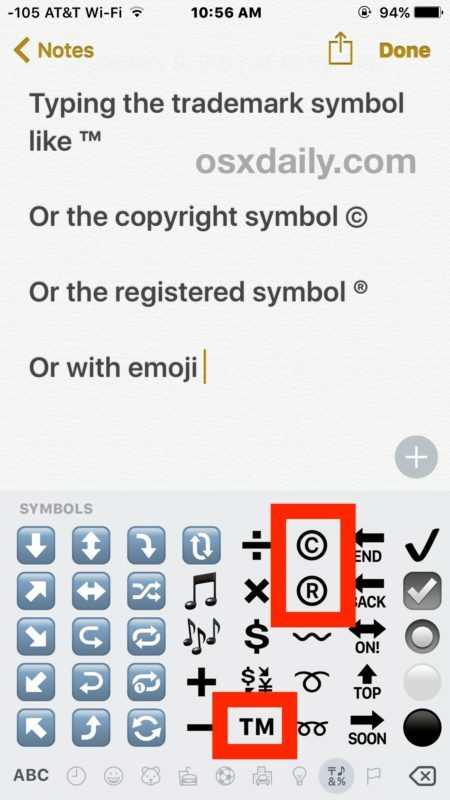 Don’t worry, tapping on one of the trademark or copyright emoji symbols will render the symbol in text, not as an emoji. A third option would be to use the iOS Copy & Paste function to copy the symbols and then paste them into the location where you want to type them, though that really shouldn’t be necessary if you use either the autocorrect method or the emoji keyboard method. 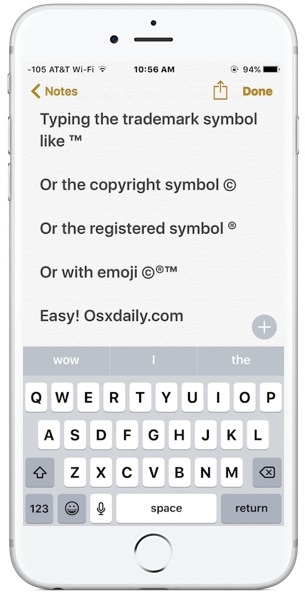 Know of another way to type various useful symbols on the iPhone or iPad? Have a better method available? Let us know in the comments below. Works exactly as described. For you to suggest that it doesn’t work means you don’t have Emoji? Not possible on iOS 10.2.1. Start from the beginning. Every iPhone has emoji and symbols. Every iPhone can type these symbols. OSXDAILY you’ve missed a step to add Text Replacements in Keyboard Setting. I added the keyboard shortcuts and replacement now works. The text replacement is added automatically in new versions, maybe you have old software? That is my guess why some people can’t figure this out. The Emoji does not need text replacement though, the Emoji works every time as direct entry. It’s in the symbols Emoji icon set. QuickType offers up “and”, “the” & “a”. The emoji method does – but the Global button is replaced by a Smiley Face, and return to the standard keyboard is achieved by selecting a symbol called ‘ABC’! I’ve kept my iPhone 6 up to date but my (Mail) keyboard doesn’t offer the shortcuts. Like Brian’s setup, typing TM only offers “a” “and” or “the” in the predictive panel. The text replacement method, John described, is also helpful for entering frequently used email addresses. I use @@, @@@, etc. to quickly enter my different email addresses when needed. BTW, works on Mac too.